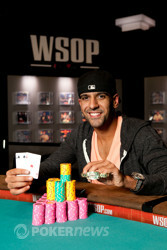 Ronnie Bardah Wins Event 40: $2,500 Limit Hold'em - Six-Handed ($182,088)! 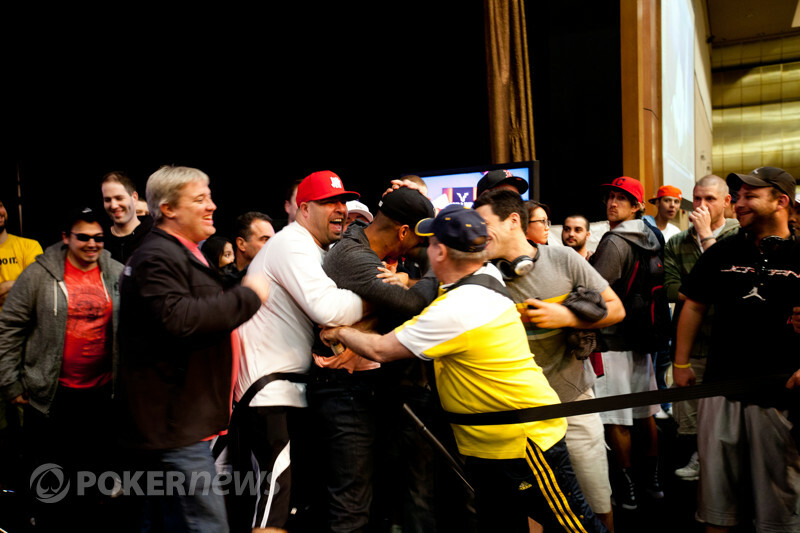 And the newest World Series of Poker gold bracelet winner is... Ronnie Bardah! Coming into the day, Bardah was dead last in chips, which was much in part to losing some big pots towards the end of Day 2. Never the one to let obstacles deter him from reaching his goal, Bardah fought and fought hard. He walked into the Amazon Room with a smile on his face and went right to work, doubling up the first hand and picking up steam from there. Before anyone knew what had happened, Bardah was right in the thick of it all. When seven players remained after the elimination of Rep Porter in eighth place, play was relocated to the feature stage in the Pavilion Room and Bardah sat second in chips. He stayed in that spot for a good portion of time while Vincent Gironda led the way. Gironda had led after Day 1 and Day 2 as well. A little under an hour after Limit Hold'em specialist Terrence Chan fell in seventh place, Bardah overtook Gironda for the chip lead by a slight margin. He flopped trip tens and turned a full house before getting a lot of value from his opponent, Gironda. From there, he put his foot on the gas and extended himself from the pack. The man nicknamed "RoNasty" was the first player over a million and he reached that mark while play was still five-handed. The more the chips were pushed Bardah's way, the more aggression he exhibited. But then, the dinner break came and Marco Johnson came back with a fury. The show after dinner was the Bardah-Johnson Show, with Gironda taking a seat in the audience as his stack was blinded away. When he finally found a hand to compete with, he couldn't beat Johnson and was eliminated in third place. Heads up between Johnson and Bardah started with Johnson holding a slight edge, but the battle flopped back and back nearly every hand. To say Bardah was the crowd favorite would be an understatement. His rail was two to three bodies deep and encompassed nearly the entire stage. Every pot Bardah won was followed by a massive uproar while his friends cheered him to victory. Bardah also made hands, plenty of them. He flopped trips with the , made a flush on the river holding the when a fourth club came in, smashed sixes full of fours in a big pot and then nailed another flush with the . Johnson just couldn't get anything going and when he did, it was going Bardah's way a bit more. But Johnson stayed tough and didn't go away easily. On the final hand, Johnson raised on the button and Bardah three-bet from the big blind. Johnson called and a flop of followed. Bardah bet and Johnson called. The turn was the and that's when the money went in. Johnson held a flush draw with the and Bardah two pair with the . All Bardah needed was no club on the river and the bracelet would be his. His rail was on their feet, pushing hard against the ropes to get a closer look. They chanted for no club to fall and guess what, they all got their wish. The landed on the river and Bardah made a full house to secure the victory. He threw his arms up in the air triumphantly, shook the hand of Johnson with congratulations and then jumped into a mob of arms hugging him on the rail. Bardah did it. Coming back from dead last in chips to battle heads up with the man who was second to last to start the day proved to be a great story. 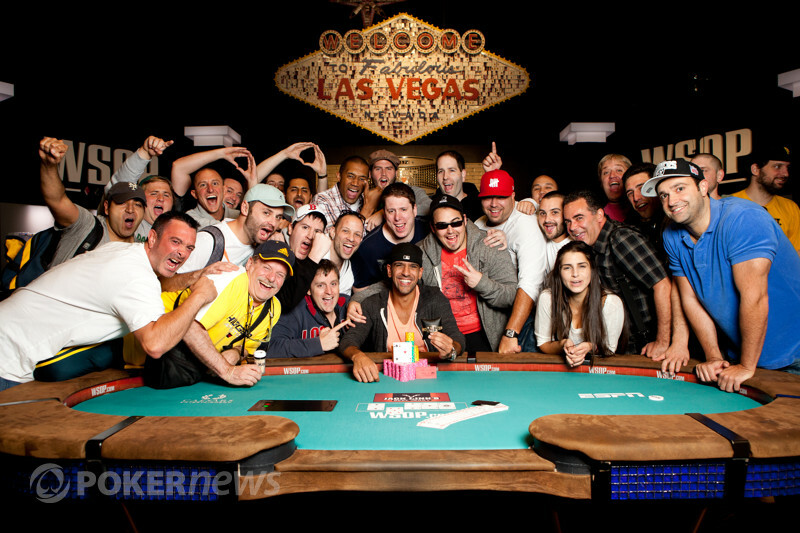 In the end, the WSOP title went to Bardah — his first — and he pocketed $182,088. Prior to this summer, Bardah took a few months off from poker to travel the world and train Muay Thai. He believes it has helped him keep a clear and focused mind at the table, while teaching him a lot about life in general. Bardah recommends the training for everyone and our guess is a lot of people may follow in his foot steps. Congratulations to all of the winners, but especially to the man from Brockton, Massachusetts, Ronnie Bardah. He's an East Coast grinder who cut his teeth in the game of Limit Hold'em and prefers short-handed play, making it only fitting that his first WSOP gold bracelet was earned in just that game. Until next time, the PokerNews team would like to thank you for following along and goodnight from Las Vegas! Marco Johnson opened with a raise from the button, and Ronnie Bardah three-bet in response. Johnson called, and the flop came . Bardah bet and Johnson called. Bardah bet again after the turn, and Johnson raised. 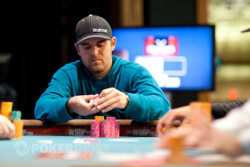 Bardah reraised, and Johnson called with the rest of his stack. Bardah had the advantage, although a club could save Johnson. The large crowd assembled on the Pavilion stage rose as one. Excited shouts filled this end of the room, with Bardah's huge rail making the most noise. The dealer burned a card and turned over the river — the — improving Bardah to a full house. After starting the day 10th of 10 in chips, Bardah had completed his comeback to win! And Johnson, who began 9th out of 10, had finished runner-up. The limits have gone up once again, and so has Ronnie Bardah's lead over Marco Johnson. The pair just saw a flop come , with Bardah check-raising Johnson then calling his three-bet. Bardah then led with a bet on the turn, and Johnson called. Johnson called Bardah again after the river brought the . Bardah showed for a flush, and Johnson mucked. Ronnie Bardah opened with a raise from the button, and Marco Johnson called. The flop came all clubs — — and Johnson checked. Bardah pushed out chips to bet, and Johnson called. Johnson check-called bets after the turn and river as well, and when Bardah tabled , Johnson mucked. Soon after came a hand in which heavy-betting on the turn with the board showing resulted in Bardah folding to Johnson's four-bet. That one helped Johnson close the gap some. Johnson would slip back again, though, after the next hand. After Bardah raised and Johnson called, Johnson check-raised the flop and Bardah called. Johnson bet the turn and Bardah called again. Then when Johnson bet the river Bardah put in a raise which Johnson called. Bardah tabled — he'd rivered a full house — and Johnson mucked. Ronnie Bardah raised, Marco Johnson three-bet, and Bardah called. The flop came , Johnson bet, and Bardah called. The turn then brought the , perhaps a harmless seeming card, but one that brought a lot of action. Johnson led, Bardah raised, then Johnson three-bet in response. Bardah quickly made it four big bets to go, and Johnson called. The river was the and Johnson checked this time. Bardah bet, Johnson called, and Bardah showed for trip deuces. Johnson mucked, and Bardah has now grabbed a better than 3-to-1 chip advantage. Marco Johnson grabbed a couple of pots to retake the advantage, then came one in which Ronnie Bardah called Johnson's button raise and the pair saw the flop come . Bardah checked, Johnson bet, Bardah raised, and Johnson called. The turn was the , and Bardah led this time, getting a call. The river then brought the . Bardah bet once more, and once again Johnson called. Bardah tabled , a hand which the announcer initially described as "six-high." He corrected himself quickly, however, noting that Bardah had filled a straight with that river four to retake the chip lead. Then came another hand in which Johnson raised and Bardah called, then the flop came . Bardah check-called Johnson's bet, then both checked the turn. The river was the . Bardah bet this time, and Johnson called. Bardah showed for queen-high, and Johnson showed — again, a four on the river had won the pot. After that exchange, the pair are virtually even. 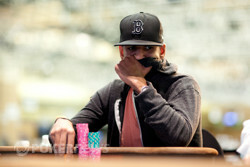 Marco Johnson raised from the button and Ronnie Bardah called from the big blind to see the flop come down . Bardah checked and Johnson bet. Bardah check-raised and Johnson called. The turn paired the board with the and Bardah led into Johnson. He got called and the dealer dealt the on the river. With the board double paired, Bardah bet out. Johnson called. Bardah showed the for a full house, queens full of fours, and won the pot.